Towerkind is an oblique end-of-the-world story seen through the eyes of a diverse group of children in Toronto's St James Town, a neighbourhood of densely populated high rise apartments. The kids in this 'towerhood' become aware of an impending catastrophe through a number of supernatural abilities. 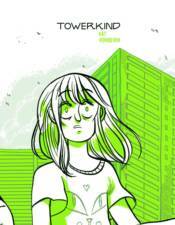 Originally done as a series of minis that was nominated for an Ignatz Award, Towerkind is a true page-turner.